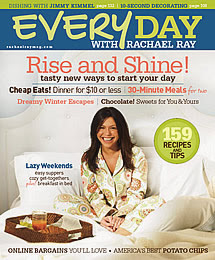 At first I thought that Rachael Ray's magazine, Every Day with Rachael Ray, was a Reader's Digest Most Trusted Brand of 2006. The confusion probably stems from their crappy website, which has the left side cut off on my browser. Then I figured out that it was not listed as one of the Most Trusted Brands. Instead, it was listed among "Other Magazines" in the Reader's Digest family. Over 1 in 4 American households are aware of Rachael Ray and 88% have a positive response to her (find her “extremely/very appealing” or “somewhat appealing”). 1 in 8 American households are fans of Rachael Ray. First and foremost, fans see Rachael as a “good cook” and also describe her as entertaining, perky, “the girl next door,” cute and funny. Rachael appeals predominantly to women, skewing toward women under age 50 who have children. Rachael also has a very broad-based appeal across most demographics. Rachael Ray fans are above average consumers of magazines. How does it feel to be an "above average consumer of magazine?"